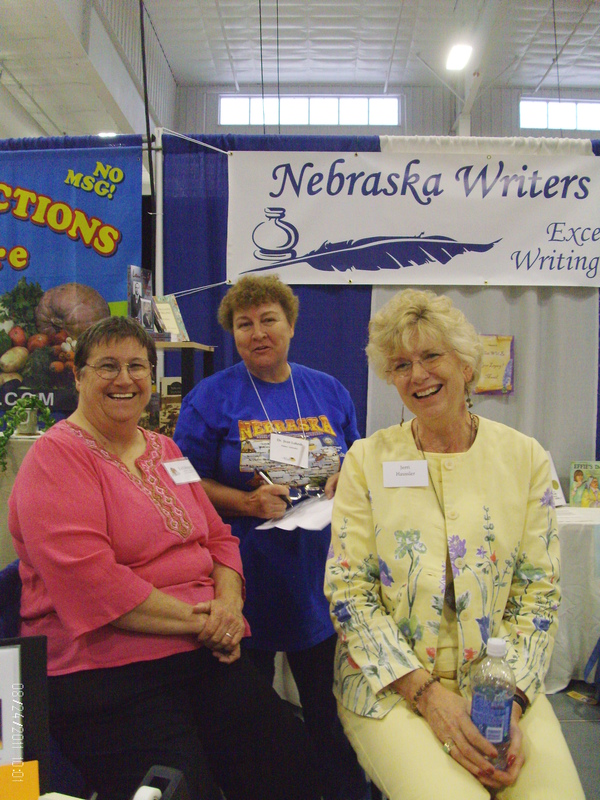 Sunday, I had the pleasure of working the Nebraska Writers Guild booth at the state fair in Grand Island. I freely admit that my volunteerism was influenced by a desire to eat corn dogs as well as ice cream from the University of Nebraska-Lincoln’s Dairy Store in the FFA/4H building. The prospect of air conditioning, a roof and walls encouraged me as well. Although NWG authors are allowed to bring their books and sell them, mostly I just wanted to meet people. And I did! I worked with fellow writers Charlene Neely (poetry), Jerri Hauser (inspirational), Dr. Jean Lukesh (Nebraska history) and Mary Maas (Nebraska and local history). I had a blast talking up the guild with these women. The Guild is a statewide organization that includes journalists, fiction writers, non-fiction writers, poets, and family historians. In the next 12 months, the guild plans to hold a Young Writers Conference in Lincoln, NE. A lot of people stopped because they love to write and didn’t know the NWG existed. A lot of others stopped because they love to read and are excited at the idea of finding Nebraska writers, particularly on subjects of state or local interest, kids’ books and fiction set in the state. 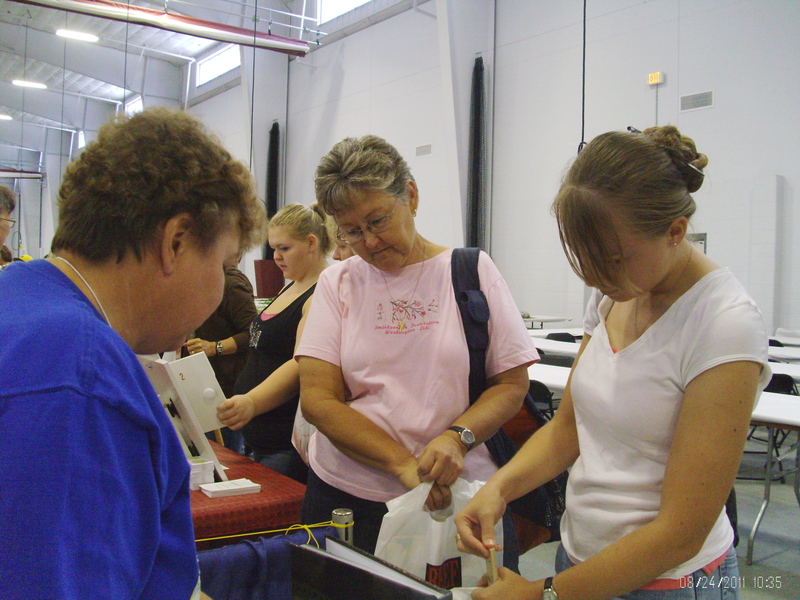 I even met a young woman who specialized in historical textiles and design in college. Hello, resource! The location provided a great view of the 4-H pet presentation, and we chatted to passers-by to the background of kids describing the history, care and quirks of various gerbils, guinea pigs, cats and one ferret. We joined the applause as the judge awarded ribbons and grand prizes. I am pleased to say that all participants earned either blue or purple ribbons for their animals’ health and well-being. My personal favorite was Princess the Cat, whose owner has a great narrative style and should look into creative writing. Although I did sell copies of Her Scottish Groom and To be Seduced, I spent most of my time handing out bookmarks and booklets, aka ‘free samples’. My romances were upstaged by a 4th grade history book! Jean Lukesh, a former teacher, wrote what may be the most popular textbook in the state. Used by 85% of our school districts, it drew kids like a magnet. The ‘double-take, ‘hey-I-used-that-book’ ‘ response happened over and over. A lot of the kids asked for her autograph, and at least one wanted a picture with her. To say that Jean is a talented local historian is like saying Einstein was kind of a smart guy. Her current project is a series for kids on Noteworthy Americans. The first in the series, Lucky Ears: The True Story of Ben Kuroki, World War II Hero recently won a Bronze Medal for Multicultural Nonfiction for Children/Teens/Young Adults in the Independent Publishers’ 2011 Book Awards. And she is hilarious and outgoing in person. Before I forget: the UNL Dairy Store ice cream is so OMG FABULOUS that I passed on the corn dog in favor of their chicken bacon ranch wrap in a tomato basil tortilla. Yum. Next year, I may have to come back an extra day to get that corn dog in.